Despite Fanny being out of action we continued northbound to Prague having concocted a brilliant plan to spend a few days in the Czech capital before returning to Vienna to collect the repaired van, then once again meandering up the motorway back to Prague to resume the original route. Changing roles to a bus passenger was a strange alteration after spending the last few months behind the wheel but not an entirely unappreciated one as I was able to have a snooze en route, something that I had successfully managed to avoid in the driver’s seat. The hours on the road were mainly spent annoying Bani by taking awful photos to fill up his camera’s memory or just picking out any flaws of his character and as much as I enjoyed trying to lesser my friend’s confidence I did miss driving as we cruised through the Czech countryside. Once again, we had resorted to an Airbnb to accommodate us and our new home was in a great spot not too far away from the city centre, next to a tram stop and opposite a few handy shops, most favourably a great sandwich shop which was ideal after the long journey. 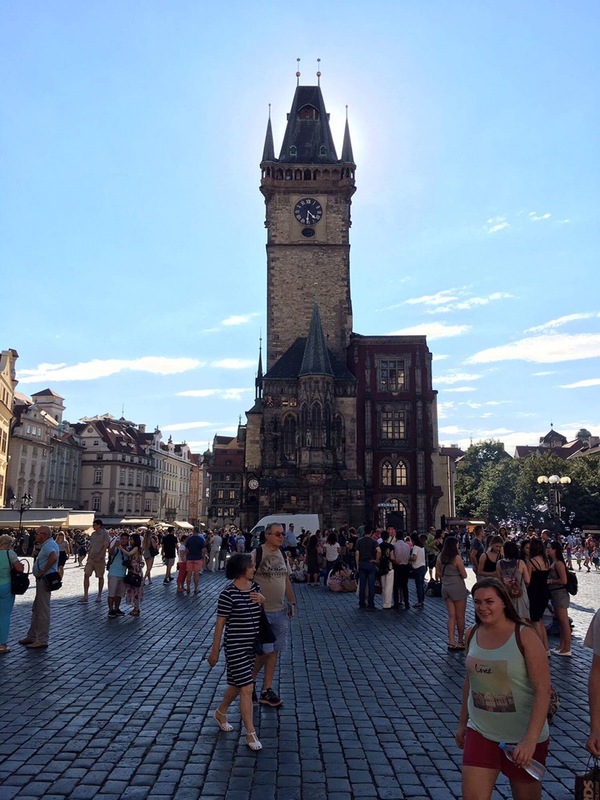 It didn’t take us to long to start exploring the new city as we headed to Wenceslas Square and took in the sites that were on our doorstep. Unfortunately, I was unable to sample the nightlife on our first evening, something I blame on the dodgy kebab I had in Vienna the day before and I was resigned to bed early as the others went on without me to the biggest club in Europe, Karlovy Lazne. Prague is well known for its big nights out, a result of its cheap beer prices, notorious bar crawls and wild clubs and I was pretty gutted to miss out, and even more annoyed when my slumber was interrupted by the trio of idiots drunkly stumbling back into our room. Flinging about kebabs (which also gave me food envy), jumping on the beds and loudly sharing their adventures was not an ideal way to recover from my dodgy stomach, but at least their intoxication bought some entertainment as Bani flew of the stairs of the top bunk into a confused ball on the floor. As expected they weren’t the liveliest bunch the following morning, but the temptation of fast food to cure their hangovers was one enough to drag them out of bed into the centre of the old town. Feeling a bit fresher after a few burgers, we headed further into the centre to check out the town hall and the astronomical clock, on which every hour a procession of 12 apostles appear from the sides of the clock as well as the ominous figure of death striking the time. After that we crossed the Vltava river on the outstanding Charles bridge which has a remarkable history itself, named after the former king, it is an old place of execution where guilty offenders were thrown off in weighted wicker baskets. The numbers engraved on the end are also special. 135797531 isn’t a random jumble of numbers but a palindrome reflecting the time the foundation stone was laid- at 5:31 on July 9th , 1357. Cool right? As nice as it was to enjoy a few days of normality on the road, business had to be taken care of and I had to jump back on the bus to Vienna to pick up the van from my least favourite Porsche garage. It would’ve been nice if one of the guys joined me, after all they were using the van too, but a day on my own was rather nice as a little break is always welcome. Being the organised, forward thinker that I am I had left Bani’s bike chained to lamppost not to far away from the station so I didn’t have to walk all the way to the outer suburbs where the van was. Being the forgetful imbecile I am I left the key for the lock in Prague. Fortunately, simply removing the wheel, vigorously wiggling the frame about and a lot of angry yanking I was able to free the bike from the lock and steal it back, without too many people suspecting me as a bike thief. The bike was only the start of my worries though as when I arrived at the garage I was quickly engaged in the biggest conflict between the English and Austrians ever (okay, maybe not ever). The gearbox had been delivered, the van had been repaired and everything was in order, it was just the problem of payment that raised concern. My travel funds couldn’t cover the cost so I was relying on a loan from my Dad, who was more than happy to help. The problem lay in the fact that, for some unknown reason, Porsche wouldn’t accept card payment over the phone, which caused at bit of an issue. Making it worse, it was an English Bank holiday back home so even a direct transfer would have to wait. Otto, the branch manager, was reluctant to just let me leave with the van and without paying and I refused to leave without it, as I would be stuck, homeless in Vienna. After hours (maybe five) of translation error strewn arguing It seemed that I would be sleeping in the Porsche office, a thought that may have helped persuade Otto to let me go as I’m sure he would rather not have a homeless, unwashed teenager in his sales office. After a lot of phone calls, trust building and sleep threatening the team of Austrian mechanics finally conceded defeat and let me leave with the van, trusting that the next day the bank payment would be sent once the holiday was over. After the most irritating and repetitive hours of my life I was finally back behind the wheel and heading for Prague and the guys, but of course, it wasn’t going to be an easy drive. Torrential rain, road works and an unsettled stomach were just a few of the factors adding up to the drive from hell, but at least the van was running smoothly (credit where credit is due, those Austrians know their way around a van). The only issue they missed was a broken wiper motor, which caused a fair share of grief in the driving rain. At one point the visibility was so bad that I resorted to using Bani’s precious selfie stick to prod the wiper blade back and forth so that I could at least see the lorries ahead. It was nice to finally find an effective use for his extendable photo taker. The reduced lane widths from the roadworks only added to the drama as HGV’s took up more than half the road whilst impatient estates tried to overtake, before deciding not to write their car off against the side of trundling lorry. Eventually after four hours of squinting through the rainfall and trying to avoid getting squeezed between a lorry and a hard place I made it to Prague. Of course there were no parking spots about though and the I one I eventually found rewarded me with a lovely parking fine to cap off my day, brilliant. No matter how much you plan, you eventually have to just wait and see what happens. Or that’s what I’ve discovered, anyway. Great stories.